If you’re celebrating a momentous anniversary, whether it’s your 1-year or 25-year anniversary, or you’re looking to surprise your sweetie with something special that says “I love you,” a beautiful sterling silver infinity necklace is a gift she’ll treasure for years to come. An infinity necklace holds special meaning when it comes to love. The Latin root of the word “infinitas” means unbounded, or limitless; the infinity symbol represents the special, life-long commitment a couple makes to one another. 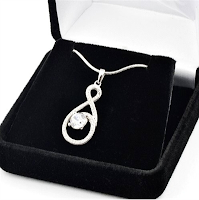 If you want to find a gift that flaunts your eternal love without breaking the bank, a CZ (Cubic Zirconia) diamond infinity pendant necklace makes a big statement for a small cost. 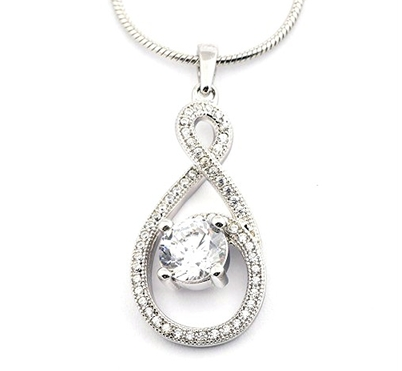 Made from .925 sterling silver with a rhodium electroplated finish, this pendant features a stunning CZ diamond encrusted infinity symbol that surrounds a clear, round cut stone in the center. The center stone is 1 carat of the necklace’s total 1.25 carat weight, and all of the stones are brilliant cut, high-quality Cubic Zirconia. This infinity pendant comes with a 19” silver chain and is shipped in a black felt gift box. Make a declaration of your everlasting love and adorn your special someone with this beautiful statement piece! For more anniversary gift ideas for men and women, visit us at www.lovieartjewelry.com!